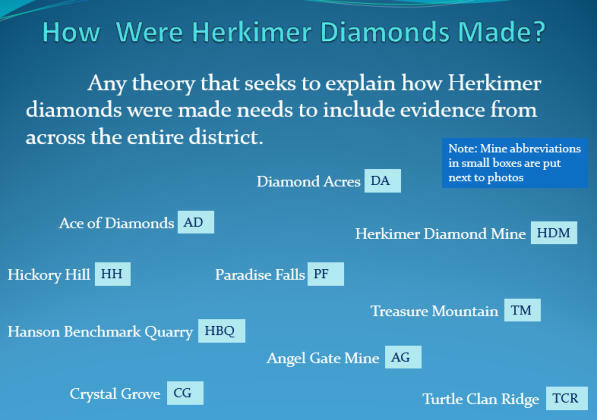 Any theory that seeks to explain how Herkimer Diamonds were formed should propose a story that can explain all of the features over the entire Herkimer Mining District. Within this website you will see photos of samples, and field collecting sites, that are from all over the entire Herkimer Mining District. We have developed an abbreviation for each mine, deposit, that helps to conserve space on the photo descriptions. The new story about how Herkimer Diamonds were made is based on the “Oil and Seed Crystal Theory”. Over a decade of research, and help from many collaborators, is behind this new story. This theory is supported by laboratory and field evidence. Additional research is in progress, with a book planned in the future to present the story in its total breadth and scope. Any new theory must be supported by evidence, but most of all it must do a better job at explaining the diversity of features seen across the entire Herkimer diamond mining district. We see the Oil and Seed Crystal Theory as being able to answer two simple questions: 1) Why are the mines across the Herkimer mining district different from each other? and 2) Why are the “black pockets” (cavities in the rock) often filled with brilliant high quality Herkimer diamonds? - - - No previous Herkimer diamond “story” has been adequate in providing reasonable answers to these two basic questions about how Herkimer diamonds were formed..